Its shark versus turtle and it wasn’t much of a fight. 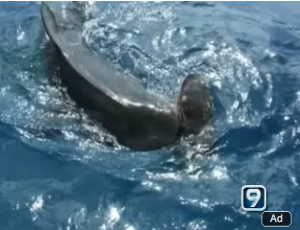 While the shark snapped its jaws, the people snapped some shots giving boaters an eye-full. The pictures were taken on Monday less than a mile off shore in Maunalua Bay just outside the surf spot called Turtles. Koko Crater and Portlock are seen in the background. The shark at one point comes right under the boat. “The shark is concentrating on the turtle, the people in the boat aren’t in any danger as long as they keep appendages out of the water,” said shark expert John Naughton. Naughton says these are the best close up shark pictures he’s seen in a long time. He’s a retired marine biologist with NOAA who studied sharks more than 40 years. He can tell it’s a tiger shark by the rounded shape of the head and the smaller dorsal fin, but the tell tail sign is its sharp curved teeth. “These teeth are perfectly designed along with the jaw structure to consume things, large animals like the turtle, they latch on to a turtle, shake their heads and even twist to take out large chunks of a turtle,” said Naughton. He estimates it’s between 12 and 14 feet long. Tiger sharks often eat the entire turtle, shell and all, then regurgitate anything they can’t digest. Naughton says it’s an essential part of the ecosystem. “We see all this all the time. We had a rash of shark sightings this summer right here in Kailua Bay and I was talking to some of the lifeguards and they actually witnessed large tiger sharks taking turtles right off the swimming beach and there’s no question the number of sea turtles has come back but they’re a natural prey for tiger sharks. People just shouldn’t be concerned,” said Naughton. KGMB9 tried to find the people who took the pictures but the email has been forwarded all over the island and we couldn’t track them down. But the original seems to be from a parasailing company.